It has two surfaces, three borders, three angles, and a prominent dorsal spine. The acromion of the scapula forms the summit of the shoulder. The coracoid process, resembling a raven’s beak, accommodates the attachment of various muscles, including the pectoralis minor, and ligaments, including the trapezoid. Scapular fractures involving the neck of the scapula have two patterns. One (rare) type of fracture is through the anatomical neck of the scapula. The other more common type of fracture is through the surgical neck of the scapula. The surgical neck exits medial to the coracoid process. Scapula connects the humerus bone of the arm to the collarbone. There are only three muscles that are responsible for enabling the movement of the shoulder blade. It is a wide, flat bone lying on the thoracic wall that provides an attachment for three different groups of muscles. The intrinsic muscles of the scapula include the muscles of the rotator cuff the subscapularis, teres minor, supraspinatus, and infraspinatus. The trapezius muscle implants into the collarbone. It is responsible for movement of the shoulder and head. The levator muscle is a small, thin muscle. It arises from the vertebrae of the neck. The rhomboideus is actually two muscles, the major and minor, located deep in the base of the shoulder blade. Its upper and outer angle the scapula bears a shallow hollow with which the rounded head of the upper arm bone (the humerus) articulates. The spine ends in a bony process, the coracoid process, the end of which connects with the outer end of the collar bone (clavicle). 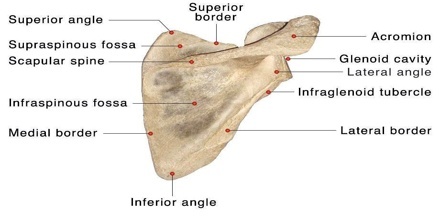 Scapula is ossified from 7 or more centers: one for the body, two for the coracoid process, two for the acromion, one for the vertebral border, and one for the inferior angle. 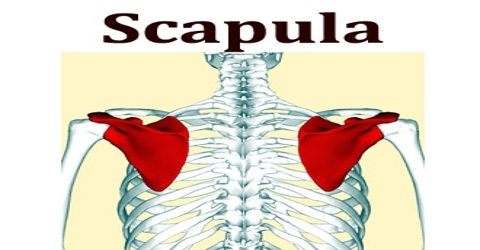 The function of the scapula is to provide movement and stabilization of the arm at the shoulder by attaching it to the trunk of the body, known as the thorax. 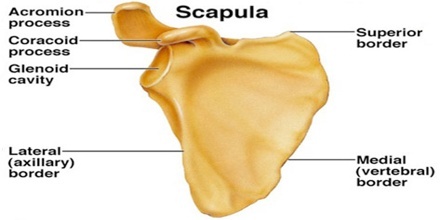 Scapula is a flat bone that is shaped somewhat like a triangle. The scapula, along with the clavicle and humerus, make up the shoulder. Ligaments attach the top of the scapula to the clavicle while the outer side is attached to the humerus bone by a socket.The humerus and scapula form a ball and socket joint, which is one of the body’s most flexible joints. Reference: thefreedictionary.com, healthline.com, vocabulary.com, wikipedia.